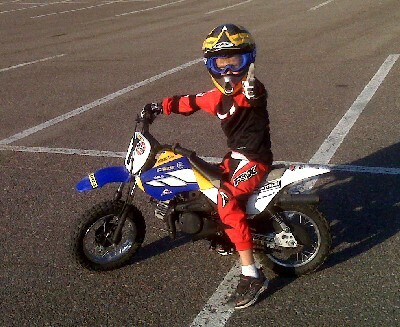 My son, JR, is a genuine motorcycle maniac who has been riding since the age of 1. 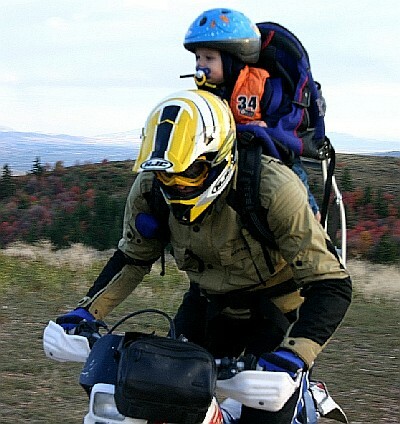 Early on I acquired a Kelty “kid carrier” backpack with a harness system that’d rival anything found in the space shuttle and rode around with him on my back. 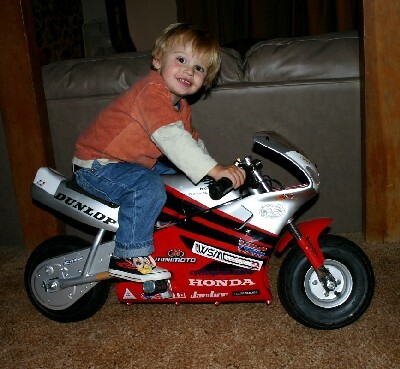 JR got his first motorcycle, a Honda minimoto electric bike, for his second birthday and did at least 8,000 laps around the house before the battery finally needed recharging. 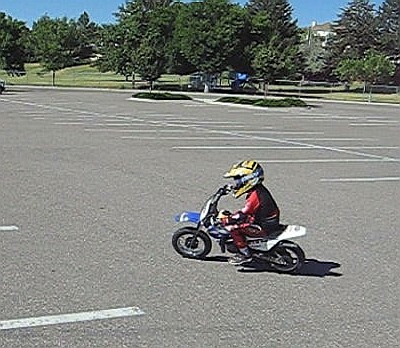 For his fourth birthday he received a 50cc dirt bike and though it was too big for him at the time he insisted on giving it a try. At first he’d ride a few feet and take a tumble, then it was a few yards, then after a while the tumbles stopped. At a time when his bicycle still had training wheels he could ride his 50cc motorcycle like a champ. Most summer evenings we take advantage of the simpatico weather and head to our secret race course in a little-used parking lot and go at it. JR’s got the full kit — helmet, boots, gloves and armor — and when he straps everything on it’s all business. He’s competitive and hates to lose — even to dad. If I set the course tight enough he can actually thump me pretty good. His little bike turns on a dime and he can carry amazing cornering speeds through chicanes. The first time he cut me off and took away the racing line I got so misty that I had to pull over for a moment. He’s even learned to give a thumbs up every time he passes. I’m afraid to let him in on the secret that his JR50 actually has a second gear. Watching my 5-year-old son develop the confidence to ride his motorcycle with skill has been among the most rewarding events of my life. He’s already had enough experience to understand that you can get hurt but he’s also learned, at a very early age, good lessons about the relationships between hard work, persistence and success. He loves his bike and will do practically anything that I ask him to do as long as we get to ride. I think that it’s the beginning of a beautiful friendship. JR has come far enough in his riding ability that he’s not above a little showboating. One evening while we were riding, a young woman came walking by and JR decided to show off with a knack-knack stand up wheelie that ended in a five star tumble. Aside from a few scrapes on the bike there was no serious damage but he was a little upset. “Dad,” he said between sobs, “I only looked at her for a second.” I kid you not. JR’s attachment to his motorcycle gives me reason for hope. Most of the good things that have happened to me in my own life are related to the confidence I gained initially through my involvement with sport. I grew up in an era when most young people explored the limits of consciousness through psychedelia but I was always more interested in exploring those same limits through climbing and bikes — and it was through these activities that I learned the value of discipline, a healthy lifestyle, persistence and hard work. Though psychologists like to explain involvement in things like racing as “merely” an addiction to chemical activity in the brain, it’s more than that. Every once in a while racing takes you to a place where the difference between you and the motorcycle vanishes and the bike becomes an extension of you. In those moments one achieves a clarity that permits any thought to be immediately articulated, through sheer force of will, into action — and in that place you are as close as you’ll ever be to every child’s dream of being able to swoop and fly above the Earth. Sometimes these moments don’t even come in your best races — but when you are there you’d give anything for another mile or another lap for it to go on just a little longer. These moments, though rare, have been enough to sustain me through everything else life has dished out. I'd estimate that one great lap in a motorcycle race is worth 50 committee meetings at the university and perhaps as many as a dozen ex-girlfriends after my skull. So in the summer evenings when JR and I race each other I can see in the low rays of the setting sun that the same spark animates his riding. As long as he keeps the same instinct that he has now to push the limits and to seek excellence I know that there is not enough dreariness in the world to bring him down for long. He’s in for a great ride.